There have been reports of up to 40% of student loan borrowers are not making their payments. While student loans can often feel overwhelming and overly burdensome, not making payments can create even worse problems. Not making your student loan payments will adversely affect your credit. When you are late making a payment, creditors will report this behavior to the credit bureaus and it will lower your credit score. A lower credit score can result in difficulties in opening new lines of credit and higher interest rates when purchasing a home or car, etc. If you do not make your payments, the student loan companies have other ways of collection from you. Federal student loan companies have the ability to start garnishing your wages and bank accounts without a judgment. Private student loan companies do have to go to court to obtain a judgment, but they can also start garnishing your wages or bank accounts if you are delinquent. A garnishment allows a creditor to seize all the money in your bank account (up to the amount owed) or take a percentage of every paycheck until the debt is satisfied. This often can put even more of a financial strain on an individual than making the normal payments. Student loans also usually do not go away with bankruptcy. While bankruptcy can help get rid of your credit cards and medical debt, student loans will not be discharged unless you meet very specific circumstances. A bankruptcy attorney can review whether you might be able to discharge your student loans, but it does require a lot more expense than a traditional bankruptcy and it is often left to the discretion of a judge to determine whether you meet the necessary criteria to discharge. Right now the required criterion for discharging your student loan debt varies depending on where you live and is a very high burden. If you do find yourself in a difficult situation, and cannot make your normal payments, there are options out there. Contact your lender and see what options are out there. If you are in a temporary situation when you cannot make your payments, possibly due to any reason including loss of a job or a health issue, lenders will sometimes work with you. If you contact your lender and explain the situation, they may be able to give you a lower payment for a time period or be able to offer you a deferment or forbearance (where you stop making payments for a certain period of time). Often these options are at the discretion of the lender, but if you need some breathing room, it cannot hurt to ask. The benefit of being in a deferment or forbearance is that even though you are not making payments (or less than a full payment), your lender will still report your loan as current. This ensures your credit will not be negatively impacted by the reporting of a late payment or delinquency. The downside to lower payments or not paying for a time period is that it is usually only for a limited amount of time and your interest will still be accruing. When you get back to making your payments, the payment maybe higher or you might be paying for a longer period of time. Additionally, if you are disabled and/or receiving Special Security Disability, you may be able to apply for another type of forgiveness. This is an administrative process and is only a viable option if you will not be able to work for the foreseeable future. There are various repayment options out there. When your federal loans come due, your loan payments will automatically be based on a standard ten-year repayment plan. However, there are payment options for federal loans that spread out your payments over more years or base your payments on your income. Depending on what your monthly income is and when your federally guaranteed loans were taken out, you could qualify to have your student loan payments capped at 10%, 15% or 20% of your discretionary income. If your income is low enough, your payment could be $0/month. However, you do have to reapply for the income-driven programs every year and submit documentation of your current income so the payment can be recalculated. After payments for 20-25 years (depending on the plan) on an income-driven plan, the remaining balance is forgiven. The downside to these income based programs is that any remaining debt that is forgiven will be taxed as income. Contact your student loan provider for more details. Also note that for most repayment plans, you do have to consolidate your loans and that can take a few months. While the income-driven plans are only for federal loans, some private lenders do have other options available. 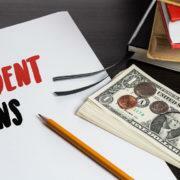 Again, if you are having trouble making your payments on your private student loans, your best course of action is contacting your lender and asking about other repayment options. If you work for a government entity or certain nonprofits, you may qualify for Public Service Loan Forgiveness (PSLF). Under PSLF, if you work full time for a qualifying employer for ten years AND make 120 on-time monthly payments, the remaining balance of your federal loans will be forgiven. These payments are usually made in conjunction with one of the modified repayment plans offered by the student loan companies because the traditional repayment of student loans occurs over a ten-year period. The benefit for this program is that any remaining balance on your student loans that is forgiven under PSLF is not taxed. As a last resort, bankruptcy may help buy some time or help with other debt. While you cannot easily discharge your student loans in bankruptcy, there are options under the bankruptcy code to help find a manageable payment. With income-driven plans, your payment is based on a percentage of your income. These are often the best options available and can really help those with substantial amounts of student loan debt. However, this option is usually not available to those with private student loans. Also, if you have to make substantial payments to other creditors, sometimes even the income-driven payments feel overwhelming. Bankruptcy is an option, but does help everyone. A Chapter 7 might be an option for those who cannot pay their student loans because of a substantial amount of other debt. A Chapter 7 can help those who qualify wipe away other unsecured debt, such as medical bills and credit cards. A Chapter 7 can also allow you to walk away from a secured debt, such as a car or a house, without having to worry about any deficiency. There are numerous advantages to a Chapter 7, but also some negative affects as well. If you are experiencing substantial hardship due to significant debt and cannot make your student loan payments, then you should consult a bankruptcy attorney. For example, after a major medical procedure, often individuals have trouble handling their payments to the doctors and to the student loan companies. An attorney can help examine your situation and determine whether you could potential benefit from filing. An attorney will also help you determine whether you qualify for this options. If you have private student loans, and those lenders will not work with you, then you have an option of a Chapter 13. A Chapter 13 is a repayment plan over the course of three to five years. This options does require steady income during the course of the plan, but all creditors are required to participate in this repayment plan or they receive nothing during the course of the plan. Your plan payments are approved by the court, and the amount is based on your income and expenses that the court determines are reasonable. Your plan may pay unsecured creditors anywhere from 0% to 100%, it just depends on what your payments will be. Certain debts, such as tax debt, past due mortgage payments or arrearages on a car, must be paid during your plan. After your plan is complete, any of your unsecured debt (other than student loans and a few other limited exceptions), such as credit card, medical bills, payday loans, etc., will be discharged in accordance with your plan. Your student loans will remain, but the benefit of a Chapter 13 is that it provided you with time to find a better paying job or handle the rest of your debt without the risk of the student loans coming after you. There are various downsides to a Chapter 13. For example, the court will review your income during the course of the bankruptcy to determine if you could potentially pay more to creditors. Similarly, any increases in income or bonuses may be required to go to creditors if you are not paying them in full. For some people, a bankruptcy means the student loan companies are off their backs for a few years and that is enough reason for them. However, you should review all options available before considering bankruptcy to handle your student loans. 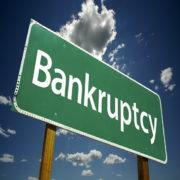 Talk to a bankruptcy attorney if you believe bankruptcy might help your situation. The attorney will be able to help breakdown whether a bankruptcy might be beneficial in your situation. There are many options out there for repayment and a lot of information. If you have any questions about what options apply to your situation, your lender is a great place to start. You also need to be carefully of the scams that try to take advantage of vulnerable and desperate debtors. There are many sites that look like legitimate sites or advertise settlements for student loan accounts or debt forgiveness. Often the offers that appear too good to be true are not real. If you are looking for real information about student loan and the repayment option, be sure you on the U.S. Department of Education’s website. Ashley F. Morgan, Esq. is a Virginia Attorney. She helps individuals and business file bankruptcy in the northern Virginia area. She also understands bankruptcy should be your last option. She wants to help her clients review all potential options to determine what is the best option in each person’s situation.